Actually, it was only my first time to Bradley Lake, so it’s kind of tough to say “back” – although my last trip to Taggart Lake did bring me within a mile or so, so there you go. It has been way too long since I’ve updated this thing, mostly because the trips were either really small and short, or non-existent. The timing was right this weekend though, and so was the weather – so I pretty much had to get out. The plan was to get up early enough to catch the sunrise, but I took too long to pack the night before so it wasn’t too hard to sleep through a couple snooze cycles with the alarm. By the time I was in the park, the sun was already up, so I hustled up to Antelope Flats with the intention of first skiing over to Mormon Row and back before heading up to Bradley Lake. The skis were borrowed from my brother-in-law, so the fit wasn’t exactly perfect, but I managed to get about 200 yards down the trail before realizing what a terrible skier I was and that I’d be much happier and productive hustling up a trail to the lake on snowshoes. I turned around and headed off across the road to the Taggart Lake trailhead. 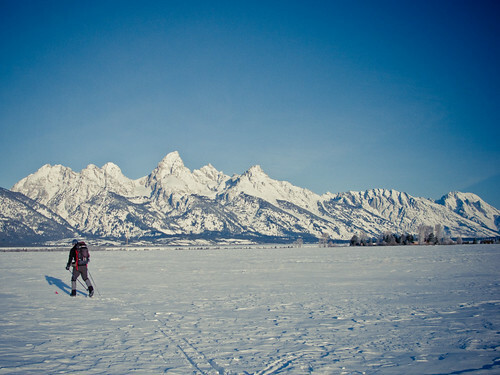 In the winter, the road between the trailhead and Signal Mountain up near Jackson Lake is closed to vehicles and opened up for skiers and snowshoeing and the like. The parking lot was mostly empty, with just a few cars full of dawn patrolers getting a late start like myself. I thought about putting on the skis, but knew it would be more painful than fun and resigned myself to clomping around for a bit on the Tubbs. The sky was cloudless and bright blue by now, and the sun was high enough to throw some long shadows in front of me as I plodded through the alternating pockets of powder and crust alongside the skin track. It’s tough to be stealthy and silent on snowshoes in those conditions, as I had wanted to try to see a moose or something, but the snow was really squeaky and the crust was thick enough that each step was a veritable snow implosion. The trail was well packed in, but it didn’t stop me from doing a little cross-country trail breaking of my own. I tried to stay out of the track as much as possible, as the cleats and claws of a snowshoe can really tear it up for the skiers, and it made for a much more effective workout as I broke trail on the upper slope above the actual trail. Reaching the split to Taggart Lake, where the trail goes through some thick young post-fire growth, I opted to stay to the right towards Bradley Lake, just a bit farther up the trail. The way to Bradley stayed up on a bit of a ridge, so as I continued to climb, the flat white expanse of a frozen Taggart Lake came into view. The trail started to get a bit steeper here, and transitioned from the openness of the old burn area to the colder and thicker forest proper. The ridge continued for only a little while before I could see to the north and where the lake sat at the foot of the imposing flanks of the Grand and her neighbors. A few ski tracks dropped down into the trees which I followed before picking up a more well-used trail which took me right to the edge of the lake. A quick breakfast of salami and cheese and crackers, as well as a few photos and I was heading back to the car.